Plotter Epson Stylus Pro 7700 with CISS - Inksystem - save money on ink! Buy Plotter Epson Stylus Pro 7700 with CISS and make 30 times more quality prints for the same money! Pay only 0.04 USD for A-4 full color print! Plotter Epson Stylus Pro 7700 is a large-format printing device. It is meant for printing promotional and advertising materials and performing different engineering tasks. Moreover, this universal Stylus pro 7700 device has a rather high operation speed. It will provide you with perfect printing quality due to the purple color, which was added into ink. Ink-jet printer Epson Stylus pro 7700 can print photos, documents and images of different formats without white frames at edges. The printer in question will allow you to get colorful photos and images instantaneously and their quality will be perfect, as if you made them at a photo lab. You don't have to use paper of large format or cut frames anymore. Epson Stylus 7700 printing device is the latest printer of a new generation from EPSON company. With the help of it you will achieve the highest level of color printing quality. It raises printing to a new standard. 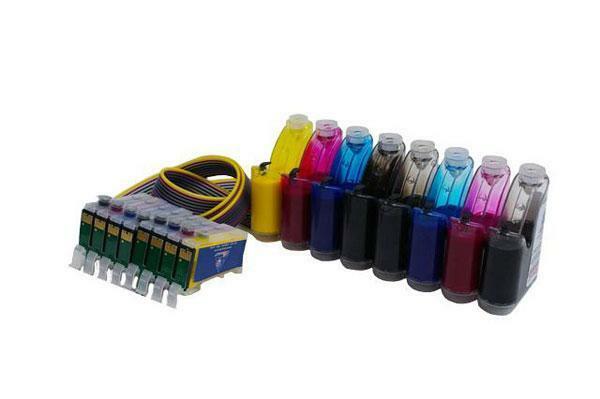 This ink-jet printer has 11-colored ink print system. And more than that, its printing resolution was increased up to 1440 x 1440 dots per inch. And at that the minimal ink drop size was decreased up to 3.5 picolitres. Due to these characteristics the highest level of image printing and the best rendering of half-tones were achieved. Furthermore, the image granularity was eliminated. As for its external appearance, the case of Epson pro 7700 plotter has become more aggressive, in comparison with the similar models in its class, such as Epson stylus pro 7900 and Epson stylus pro 7890. The printer has obtained sharp forms and lost streamlining of its body. But it has become more effective. The colour design is the same. Its case combines dark plastic with silver colouring. But the designers have decided to remove a glossy semitransparent cover, which the previous models have. The construction of Epson 7700 remained the same. The USB 2.0 Hi-Speed interface and a power socket are located on its opposite side. On the control board, in the centre of it, you could see a rather large display. But it seems big just at the first gaze due to its protective "glass". To the left of the display, you could find "on/off" buttons. The printer has double nozzles, due to them it will provide you with a rather high printing speed up to 40 m2/h, and at that it will not lose its printing quality. You can change the ink block without its print head and in fact you could set two and more cartridges. 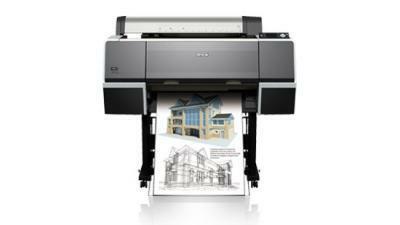 Recently users of Epson stylus 7700 pro could appraise Epson Ultra Chrome HDR water-soluble ink. This ink was elaborated for digital colour printing. It was positioned by the manufacturer as a perfect ink for printing contrast, bright, qualitative images with more saturated colours. Moreover, if you use original consumables from Epson Company in addition to the recommended ink, your photos will have light-resistance more than 200 years. Due to the ink-jet printer in question you will able to make prints on CD/DVD surfaces, to print different documents, images and photos from digital cameras and other medias directly via USB Direct Print and Pict Bridge. Now you don't have to use a computer for that.